Published with the Saint Louis Art Museum. 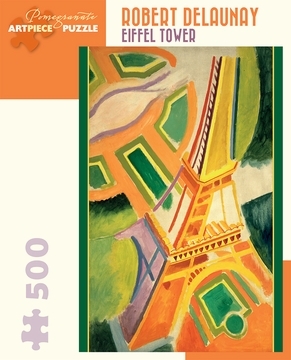 Robert Delaunay’s Eiffel Tower represents this famed Parisian landmark, which was a symbol of modern technology in the early twentieth century. The dark steel structure has been transformed into rich tones of yellow, orange, and lavender; the surrounding gardens are abstracted patterns of green and yellow. Influenced by Fauvism, Delaunay affirmed that “everything is color in nature.” The artist uses an aerial viewpoint, probably informed by his own background as an early aviator.